This stunning painted pine bench was recently acquired from one of our continental suppliers. It has lots of character, featuring an aged and worn paintwork, and dates from around the 1930s / 1940s. 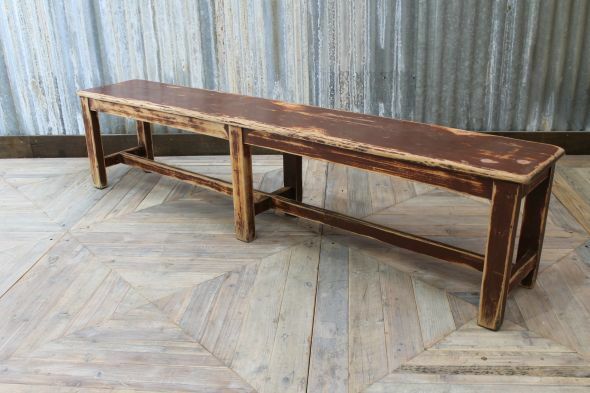 This bench is a great choice of seating for any vintage inspired interior. The bench could be used in a restaurant, reception area or in a large country kitchen. We have more benches available, in various styles, browse our vintage seating range to see the full collection. This painted pine bench is in good condition, however, please be aware that it is a vintage piece and will have signs of wear and tear, which we think only adds to its authentic appearance.